Hello my dear friends, once again my post this time talk about best friends. Do we need a best friend in our lives? I am strongly believed mostly of us would answer yes we need best friend. So it is with me! I have a very best friend named Kimiko. She lives in Japan. I have a close friendship with her since we were in college. Beside my Parents and Husband, she’s the one that really knows my secret. To her I could openly and shamelessly talk about everything, even something very personal. Our closeness sometimes exceeds our closeness with our own kin. We have a strong emotional bond. Believe it or not, she once suddenly phoned me in the early morning and said “I don’t know why, this morning I just feel you have a problem. Talk to me…” at the time yes she was true. I had a problem in the office. On the contrary, I also soon could feel if she currently has problems. My dear friends, I pondered something. If having a best friend of human beings has been very delightful, what about have a very close friendship with our God? It’s something unimaginable how happy we are. The question is, is it possible? Isn’t God too great and cannot longer be reached by the human ability? That’s right; God is so great, incomparable with the humans. But being a close friend of God isn’t something impossible but actually very possible. From the beginning God longs we could be His best friend but unfortunately man fall into the sin from the beginning. However, God didn’t stop waiting for our willingness to come to Him and got along closely with Him. What an incredible close relationship! A great form of timeless relationship. We could see through this verse how Enoch was able to maintain a relationship with the Lord; live in harmony with God for so long. His faithfulness was tested in the long time span, more than of the normal human age. Enoch lived in the broken era. He lived in the era before the world destroyed by the flood. Enoch lived in the days of the most evil. Human fell into the sin (Genesis 3), murder happened for the first time (Genesis 4), and finally the earth destroyed by the flood (Genesis 6). 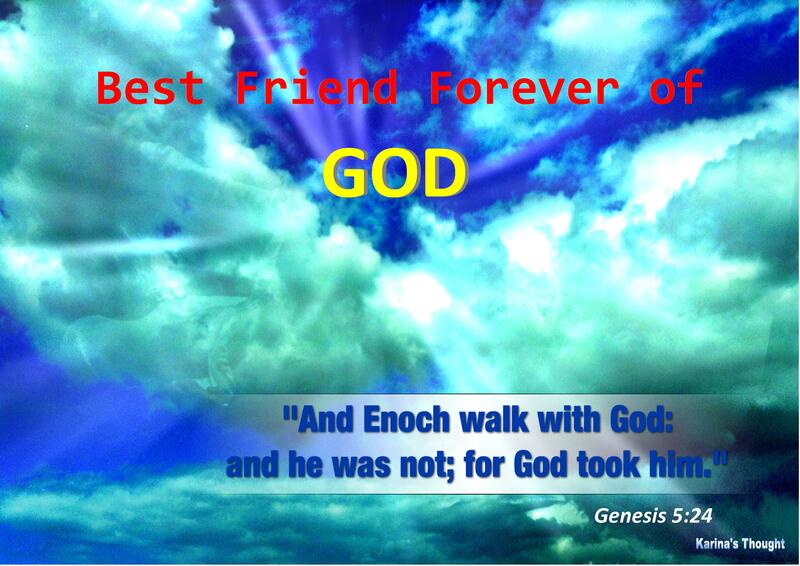 But in the world filled with sins, Enoch remain faithful live, made a friendship, and walk with God for very long time. He wasn’t affected by the worldly temptation. The Bible mentions the fact that Enoch walked with God for more than three hundred years. What happened to Enoch at the time? We all know that because of his very close relationship and walk with God faithfully; he didn’t experience a physical death. Enoch was taken away directly from the sinful world to Heaven with God forever. Jesus said this thing not just for His disciples but also to us. He longs become our best friend and He started proactively with the concrete proof by sacrificing Himself to die on the cross for our sin. He really loves us as His true friend. The second thing, have a close relationship and walk with God also mean that we are in line with God. We walk “side by side” with God with the same direction. “Enoch walk in God, not God walk with Enoch” So, it doesn’t mean God must follow the way as our will, but we must follow God’s way and everything we do must be in Him and only to glorify Him. And when we walk with God we will not go astray like sheep that choose their own way. My beloved readers, allow me to end this post by encourage all of us to learn from Enoch’s life who always walked with God and faithfully get along closely with God. Next week we will commemorate the death and resurrection of Jesus Christ the Lord. Approaching of His resurrection day let’s take time for self-reflection. If we say we love Jesus the Lord, Have we make Jesus the Lord as our true friend in our lives and always make a very close relationship with Him every day? Have we been able to hear more His voice than asking Him to hear our voice? Which way we walk, walk in God’s way or worldly way? God may not take away us like He did to Enoch, but we have been awarded the greatest love in human life. God gave His only son died on the Cross to redeem our sins. This is a proof of how great His love as a true friend. God doesn’t ask us to sacrifice our lives. He just longs and asks us to love Him earnestly and wholeheartedly, life in Him, has a very close relationship, and glorifies Him. Let’s make this Passover season to be a momentum to rebuild and renew our relationship with the Lord Jesus and truly make Him as a true friend, always walk with God in every step of our life. Always hear His voice more and do all which has been commanded by Him, and always maintain our intimacy with God through His word. Rebuild a healthy conversation with God through diligent prayer. Eventually people will know that we are the Best friend forever of God. Amen. My beloved readers, although Easter day still a week away, allow me, my husband, and our little son Andrew say, Joining you in gratitude for Christ’s sacrifice and the joyful renewal it brings to all God’s children this Easter season. Happy Easter! We love you all. This post inspired by a story when I was teen. At the time, in the morning, my daddy came to me brought a cup of coffee. “Come here, my princess! I want to you show you something” I came to my daddy and soon he showed me something. “Look at to the little bee in the coffee. Please pay attention on what they do.” My daddy said seriously. A bee trapped in the cup of coffee and trying hard to find the way out. Then my daddy said again, “You know what, actually this bee still could fly though he already wet. The bee actually could able to see a wide way to out above but he just focused to find the way out through the edge of the cup and eventually this bee will getting weaker and die. Princess, I hope you could be able to get the meaning of what I have showed to you today. 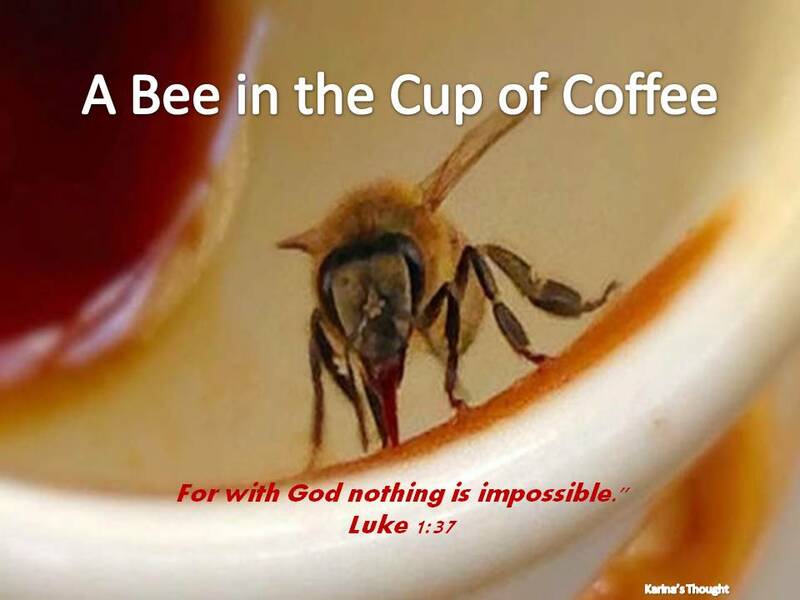 Learn from the bee in the cup of coffee. My beloved readers, bee in the coffee is an example that often happened in our lives. When we trapped with the huge of problems, we often forget that we have God above as our way out. We often looking around find the way to out from our problems. We often rely on our own strength, on humans; even find out the other alternative that considered as a sin in the God’s eyes. In the other word, we are looking the worldly way and then we forget God who reigned in The Heaven. We lost of the right focus, our eyes no longer able to see God that can gives us the answer of our problems. I reminded the story of Joseph. Joseph been directly experienced a situation like bee in the coffee when he was plunged into a a dark cramped pit not by strangers but even by his own brothers. Jealousy blinds the eyes of his brother and cruelly Joseph persecuted by them. If we read carefully this story, there is no record that Joseph screaming in fear, pleading for mercy to his brothers. There is no single verse says that Joseph panicked even though no one knows how long he will be left in the well. If we are in a situation like that, maybe we would think that it is the end of our lives. Slowly tortured to death there. Don’t know who will be passing, and even if any they not necessarily want to help. But Joseph didn’t think so. I imagine what Joseph did, he looked up and saw light coming from above, and think that as long as he still sees “light” from above, it means that his hope hasn’t end. Joseph totally realize there’s God up there who able to release him from the pit. Perhaps not soon but in time God will lift up and save him, even bringing him to successes like the vision which he had held before. Beside the Joseph’s story, we could see what happened at the end of Jehoshaphat’s reign. At the time the nation of Judah was hit by a big fear because they might be attacked by a combined army of Ammonites, Moabites and Edomites. It was certainly a big disaster for the nation of Judah. Jehoshaphat’s forces weren’t enough to face such invasion. The enemy has big number of troops and has been mentioned that they already seize land located not far from the troops of Jehoshaphat. Jehoshaphat was scared but the he took a correct decision. He looked up to find God. “Our soldiers are not enough. Power or our strength is not enough. We will perish if it relies on the power that we have, and we do not know what to do. But we direct our view to You, and believe that your power is more than able to release us from this terrible threat.” That’s roughly what he said in his prayer. Notice when facing the problems, Jehoshaphat didn’t circling looking for solutions at the wrong places, but he immediately directed his eyes upward! To God! What happened next? We all know that they become a winner without having battle at all! How can that be? With our logic it wouldn’t be possible, but history proves again and again that the God’s power is able to overcome any such impossibility and take his children that always rely on Him to get into one victory to another victory. My dear friends, Often the problem actually became more complicated when we responded it with wrong attitude. Our emotion become unstable, make a wrong decision, hasty, impatient, complaining, or even we give up. All of it will make us forget to direct our eyes upward to seek God, and thus spared from God’s miraculous power that can liberate us from the very bad situation. We will be like a bee that exemplified by my father. Indeed bee can still easily fly even though his body was wet but panic makes bee seem unable to think clearly and simply looking for a way out around the glass and then forget that solution, however, lies above of him. Completion of a problem will depend on how we react to it, the decisions we take, which of course would only be good if we direct our view in the right direction. The more mistakes we do to complete it, then it will only worsen the situation. But those who wait on the Lord shall renew their strength; they shall mount up with wings like eagles, they shall run and not be weary, they shall walk and not faint. (Isaiah 40:31) God also said: “Blessed is the man who trusts in the Lord, and whose hope is the Lord. Let’s put one important thing in the deepest of our heart that in the Lord Jesus there is always an answer because He is the answer of everything we ask.